Galerie Neue Kunst (Hans Goltz), Munich (by 1920). J.B. Neumann (New Art Circle), Berlin and New York. Frederick C. Schang, New York (by 1953). Saidenberg Gallery, New York (by 1954). Frederick Zimmermann, New York (by 1956). Harold Diamond, Inc., New York. Anon. sale, Sotheby's, New York, 12 November 1988, lot 161. Stephen Mazoh & Co., New York. Waddington Galleries, Ltd., London (1988). Yasaka Gallery, Nagoya (by 1990). Private collection, Japan (circa 1990); sale, Sotheby's, London, 6 February 2008, lot 181. "Paul Klee," Der Ararat, May-July 1920, p. 7 (illustrated). 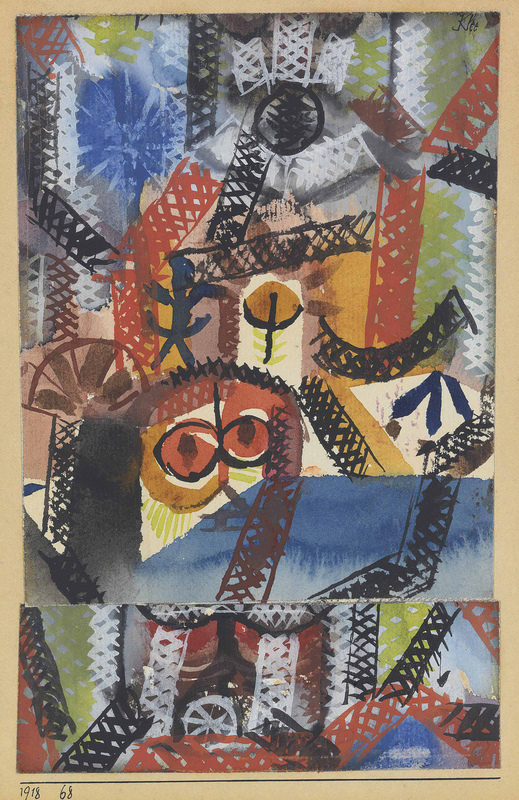 L. Zahn, Paul Klee, Leben, Werk, Geist, Potsdam, 1920, p. 62 (illustrated). F.C. Shang, Paul Klee, Collection of F.C. Schang, South Norwalk, 1953, no. 8. W. Kersten, "Paul Klee Zerstörung, der Konstruktion zuliebe?," Marburg, 1987, pp. 45, 143, and 151. C. Hopfengart, Klee, Vom Sonderfall zum Publikumsliebling, Stationen seiner öffentlichen Resonanz in Deutschland 1905-1960, Mainz, 1989, p. 41. A.-M. Ehrmann-Schindlbeck, M. Schmid and F.-J. Verspohl, Paul Klee in Jena 1924, exh. cat, Stadtmuseum Göhre, Jena, 1999, p. 148. The Paul Klee Foundation, ed., Paul Klee, Catalogue Raisonné, Bern, 2000, vol. 2, p. 481, no. 1915 (illustrated). Munich, Galerie Neue Kunst (Hans Goltz), Paul Klee, May-June 1920, no. 165 (illustrated). Kunst-Verein zu Jena, Paul Klee, July-August 1920, no. 19. New York, Saidenberg Gallery, Paul Klee, An Exhibition of Paintings and Drawings Commemorating the 75th Anniversary of his Birth, March-April 1954, no. 4. Kunstmuseum Bern, Paul Klee, Ausstellung in Verbindung mit der Paul-Klee-Stiftung, August-November 1956, p. 69, no. 414. Kunstverein Hamburg, Paul Klee, December 1956-January 1957, p. 16, no. 79. Chiba, Kawamura Memorial Museum of Art; Sapporo, Hokkaido Museum of Modern Art and The Miyagi Museum of Modern Art, Paul Klee, Erzählung und Schöpfung, June-December 2006, p. 67, no. 45 (illustrated in color). London, Timothy Taylor Gallery, Ballet Mécanique, 2007-2008. Towards the end of World War I, Klee's work quickly matured, and his range of subject matter expanded and deepened philosophically. In 1918, the atmosphere of artistic and political revolution in Munich, Klee's pre-war travels in North Africa, and his assimilation of Delaunay's Orphist influence were all coming to fruition, particularly in his handling of color and the transformation of his drawing and form. It was during this year that Klee created Barbarische Komposition. The glowing, jewel-like resonance of Barbarische Komposition emerges in the combination of delicately modulated color and imaginative, energetic and meticulous draughtsmanship. It was Klee who famously said that drawing was just "taking a line for a walk" and in this work he demonstrates this principle in the simplest way, contrasting graphic simplicity with a diverse palette. Indeed, in the present painting the artist seems to take line for a dance, for there is something of the pleasure of articulating movement evident in the lyrical expression of the curved interlocking lines. Klee's art is unique in the history of the twentieth century in that he was the only modern artist who allowed his work to roam freely between the organic and the geometric, the constructive and the intuitive, the figurative and the abstract and between the purely linear and the wholly chromatic. Barbarische Komposition was included in Klee's first major survey exhibition which was held at the Galerie Neue Kunst in Munich in the Spring of 1920. The exhibition was the outcome of a contract Klee had signed with the dealer Hans Goltz in October 1919 and provided the artist with some financial stability. "I paint, he markets and advertises," Klee wrote to his friend Wilhelm Hausenstein in June 1920 (quoted in O.K. Werckmeister, The Making of Paul Klee's Career, 1914-1920, Chicago, 1989, p. 236). The artist provided autobiographical information for the Munich exhibition catalogue, including his declaration, "On this side I am not at all comprehensible. For I reside just as well with the dead as with the unborn. Somewhat closer than usual to the heart of creation. And still by far not close enough" (ibid., p. 233).